Welcome to the RMC Club Mid-Atlantic Branch. Our branch's goal is to gather the community of ex-cadets of the Royal Military College of Canada, Royal Roads Military College, and Collège Militaire Royal de Saint-Jean, who live in the US Mid-Atlantic area. The branch is centered in Washington, DC, and welcomes ex-cadets from throughout the U.S. mid-Atlantic region as members. We host quarterly Happy Hours and other social events; and participate in the DC Metro Joint Service Academy Business Mixer with our American peers. 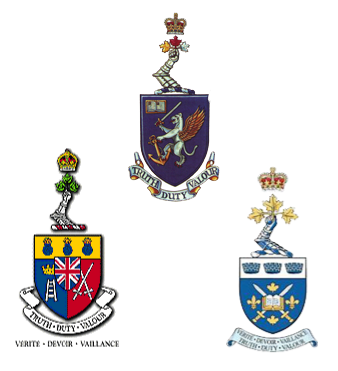 The RMC Club provides a variety of services for its members, support for the Cadets of RMC and is engaged in preserving the customs, traditions and legacy of the Royal Military Colleges. The preservation of customs, traditions and leadership excellence is ensured through the RMC Club Foundation. The Foundation is a non-profit organization, which acts as a network for financial support, donations and fund-raising in support of the Colleges. The alumni is made up of Lifetime and paid-up members who are either in active service with the Canadian Forces (Regular & Reserve component), civilian occupation or retired.